IF YOU need a conversation killer at your next dinner party, just ask everyone to list the best and worst moments of their year. They’ll all furrow their brows and silently stare into their pasta for at least 20 minutes as they try to remember everything that happened in the past 12 months – as I discovered when I proposed this fun game at dinner on New Year’s Eve. After a few champagnes our group of eight had come up with a pretty impressive list of highlights, including the birth of a first child, the start of a new career and watching the sun rise over the Grand Canyon. Lowlights, which we restricted to events that weren’t properly sad to prevent too much maudlin New Year’s Eve mooching, included a $3000 car repair bill, losing $500 worth of duty-free presents on a Hong Kong bus and selling a business that had taken a lifetime to build. We all agreed these were things we were happy to leave in 2012, never to be repeated. Now that I’ve had some more time to think about it, I’d like to add to that list. Bacon. Bacon in chocolate, bacon in cakes, bacon flavoured chewing gum, bacon-wrapped bacon. Seriously, get over it everyone. Hugely anticipated films being a bit crap. I’m looking at you, Ridley Scott and Peter Jackson. Moustaches. 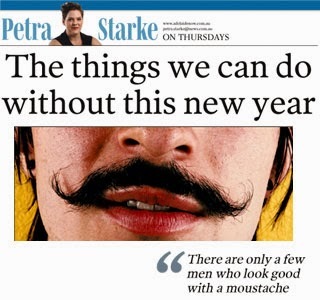 There are only a few men who look good with a moustache and that’s Tom Selleck, Burt Reynolds, Sam Elliott and Ron Burgundy. And don’t get me started on people who wear them ‘‘ironically’’. Drinks in jars. A crime against beverages often committed by the ironic moustache brigade. I don’t want to drink an $18 cocktail out of your nanna’s old Fowler's Vacola, I want a proper glass, thank you. Restaurants that serve ‘‘small plates’’. Would I like to pay double to eat my meal separated into 16 tiny portions across an entire dinner service? No, I would not. Reposting hoaxes on Facebook because you’re gullible and can’t be bothered checking if they’re legitimate. No, Morgan Freeman did not speak out about the Newtown shooting just hours after it happened. No, Facebook will not give $1 to cancer research for every ‘‘like’’ that photo receives. And yes, you need to stop falling for this crap or I’m defriending you. Food trucks charging restaurant prices. The food truck revolution is great – it lets entrepreneurial chefs get into the game and often showcases new and different cuisines. But $15 for a hamburger and chips served from a van window? A fiver for a single taco? Bickering in Parliament. From the definition of words to the relative offensiveness of shelled mussels, there was far too much petty arguing among our politicians last year. It’s so boring. Which brings me to the main trend I want to leave behind in 2012: Being offended. From Alan Jones’ remarks about the PM’s late father, to Peter Slipper’s text messages, Gillard labelling Tony Abbott a misogynist and Twitter trolls – there was an epidemic of people being offended in 2012. You have permission to repost that on Facebook. First published in The Advertiser, January 3, 2013.